Successfully Added Action Sports Helmet Camera (30FPS) to your Shopping Cart. Action Sports Helmet Camera (30FPS). If you enjoy an active sports life, then capture all the action, all the time! Able to record digital video at a resolution of 640 x 480 (VGA) at 30FPS, this lightweight, compact helmet cam is the right one for you. Imagine a game of paintball where all the intensity of every shot is recorded for everyone else to enjoy over and over again. Or, record yourself jumping from the plane, going in to freefall and skydiving! 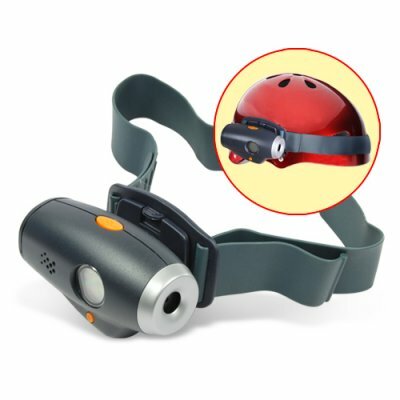 Great helmet cam functionality and an unbeatable factory-direct price make this Action Sports Helmet Camera a great choice for outdoor sports enthusiasts, those who enjoy two and four wheel vehicle action and those who enjoy fast action games like paintball. Stocked in our warehouse for immediate order fulfillment and worldwide shipping to any destination whether it's you or your customer. From your best source for cutting edge electronics, Chinavasion. Great for outdoor sports and activities such as two or four wheel vehicle racing, skiing, biking, rockclimbing, paintballing and skydiving. This is designed to strap onto most style sports helmets (helmet not included). Just got the camera today and my first impression is that it is easy to use and the video quality is very good when compared to the other helmet cams. I opened the package and put the cam on my helmet and went for a ride straight away. The only issue is the sound especially when I am riding but I expected to have the wind problem but that isn't really an issue for me. I will be using it more for video anyway. on 2010-05-08 06:06:30 cool gadget! it's got simple controls, lightweight, in-built laser points to 'subject' of the video- as there is no viewfinder, i guess this'll do. in daylight it takes really good quality videos but a little lacking when you use it indoors. may be a little bulky but it does what it says on the tin.... and for the price paid, i ain't complainin'! on 2010-03-16 02:16:09 Fantastic Sports Action Camera at the right price! From ordering to delivering to my door 3 days! My first order from Chinavasion and now I am definitely going to order frequently from you! Excellent product and well above average service. Thank you so much! You have a very happy new customer.